L'enfer des Projets-Voitures: Citroën Grand R or Renault Gordini? Allowing you to vote on two potential 24 Hours of LeMons race cars yesterday was fun (and the BMW no doubt deserved its victory in the poll), bu the problem was that Low Budget Race Car Hell just isn't difficult enough. You're tearing out most of the electrical stuff that would normally drive you crazy on the BMW, and CRX Hell is no big deal if you don't care how ugly the car turns out. Therefore, in order to balance out the Fun-To-Torture Ratio (FTTR) for the week thus far, we must now dive into the boiling pit of molten sulfur that is French Project Car Hell! 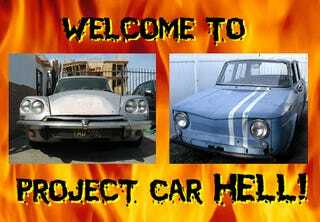 Project Car Hell, LeMons Edition: CRX or BMW? See, French cars are really ideal Hell Projects. They're extremely cool and weird, so we all want one.. yet they were designed by mechanic-hating sadists and banged together by disgruntled workers in between bouts of manning the burning-tire barricades during general strikes. And speaking of cool French cars, how could you possibly resist this '66 Renault 8 Gordini? This car has a nice autocross/hill-climbing racing history from back in the day, and the seller has provided all sorts of interesting historical info in the listing, which is great. Also great is the crazy styling and rear-engine design. Not so great... well, there's rust. Lots of rust. The engine hasn't run in 20 years, and the previous owner alluded darkly to the need for an engine rebuild (probable translation: oil pan full of broken rods, valves, and, heck, probably some chunks of hot fuel rods from the Fermi Breeder Reactor). But don't worry about that stuff, because the deal includes a parts car! Be careful not to sprain your fingers hitting the BID NOW button! We love that Gordini, of course, but perhaps some of you feel that its condition isn't quite mysterious enough to provide the sort of surprises that make for a true hell project. For you, monsieur, we have this 1968 Citroën Grand R, being offered for $3500 with a heart-stoppingly low odometer reading of just 8,045 miles! Cynics might point out that, since we're dealing with a French car, the odometer might have crapped out in 1969, and especially suspicious cynics might opine that some odo-adjusting skullduggery might be involved. But who the hell cares, when you get not only the leather interior but one of the best yellow-on-black California license plates ever? YAD 596! According to the seller, a man or woman of few words, it's "Running Well" and "Needs Little For A Complete Restoration!" See, how much can "Little" cost? Probably a weekend of work and this lovely Citroën will be as solid as the Maginot Line- and just as useful!